Start the MS Exchange Management Console from Start > Programs > Microsoft Exchange Server 2010 > Exchange Management Console. 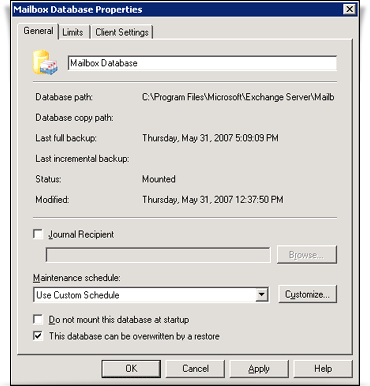 Right-click the 'Public Folder'/ 'Mailbox' database that needs to be restore and choose the 'Dismount Database' option. 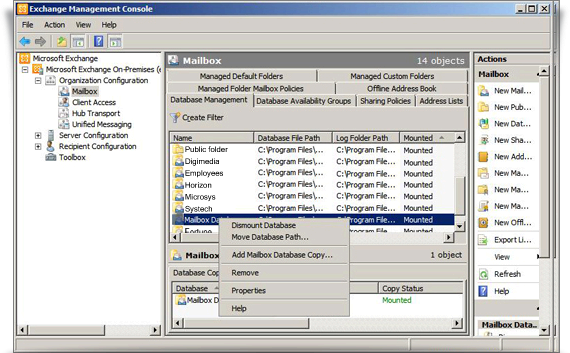 Right-click the 'Public Folder'/ 'Mailbox' database and choose the 'Properties' option. Select the 'Maintenance' tab from 'Properties' and then enable the option 'This database can be overwritten by a restore'. Next, click 'Apply' followed by the 'OK' button to confirm the operation. Perform steps ‘c’ and ‘d’, listed above for all databases that need to be restored. 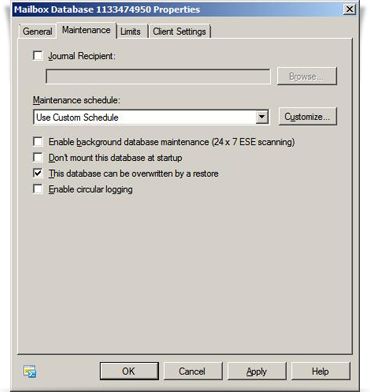 Note: Once the above-mentioned steps are executed, close the 'Exchange Management Console' before initiating the restore operation. Start the MS Exchange Management Console from Start > Programs > Microsoft Exchange Server 2007> Exchange Management Console. Select the 'General' tab from 'Properties' and then enable the option 'This database can be overwritten by a restore'. Next, click 'Apply' followed by the 'OK' button to confirm the operation. 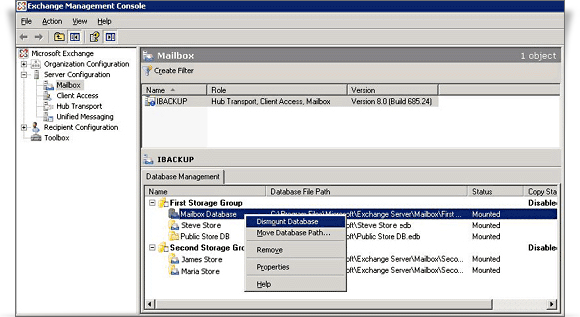 Start the MS Exchange System Manager from Start > Programs > Microsoft Exchange > System Manager. 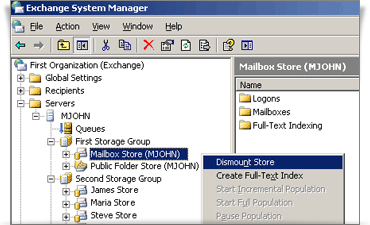 Right click the 'Public Folder' store / 'Mailbox' store that needs to be restored and choose the 'Dismount Store' option. Right-click the 'Public Folder' store/ 'Mailbox' store and choose the 'Properties' option. Click the 'Database' tab from 'Properties', enable the option 'This database can be overwritten by a restore', click 'Apply' followed by 'OK' to confirm the operation. Perform the steps ‘c’ and ‘d’, listed above for all the databases that need to be restored. Note: Once the above-mentioned steps have been executed, close the 'MS Exchange System Manager' before initiating the restore operation.